Driving away in a new supercar is a milestone for a lucky few whose sustained hard work has finally paid off. With premier footballer’s wages venturing past half a million a week, we look at the Good, the Bad and the Ugly of Premier League Cars. Retired defender William Gallas did not go unnoticed in his chrome Mercedes-Benz SLR McLaren. The former Arsenal defender debuted the jaw dropping chrome paint job when leaving the Emirates stadium. Not only unique in its paint job, the SLR McLaren is said to be the world's fastest convertible. Built as a joint project between McLaren Automotive and Mercedes-Benz, the supercar had a limited production of around 3,500 over a span of seven years. The speedster can do 0-60 in an amazing 3.6 seconds and boasts a top speed of 365km/h. But a car of this power is not enough to engage Gallas. Gallas has since added a Mercedes ML63 AMG 4x4 to his collection, taking the value of vehicle portfolio up to an astounding £500,000. After a whirlwind rise to the Premier League, Jamie Vardy bought his £168,000 Bentley Continental GT to celebrate signing a £13m Leicester contract. His 3½-year deal saw him banking £75,000 a week, so dropping over 100k on the GT wouldn’t have caused a second glance. The GT is created for swift, exhilarating driving, and is built on an innovative chassis and electrical architecture. featuring a completely new 6.0 litre W12 engine and an 8-speed dual-clutch transmission, for smooth, fast and efficient gear changes. Just days after unveiling his camouflage wrapped Bentley Continental GT Balotelli, former Liverpool striker Mario Balotelli debuted his second vehicle wrapped vinyl. Balotelli’s bold gold Range Rover Evoque is one of the more modest cars in his motor collection. As the baby of the Range Rover line-up, the Evoque is designed to offer all the appeal of a luxury SUVs in a smaller, stylish and more affordable package. Powered by turbocharged four-cylinder engines the Evoque does not pack as much of a punch as Balotelli’s Lamborghini Gallardo, his Bentley Continental GT or his Ferrari 458 Spider. While this may not be a footballer’s choice of wheels, it has been driven by multiple Portsmouth players. Being forced to drive a Reliant Robin is a tradition in the Portsmouth club. It’s hard to find anything positive to say about the Reliant Robin. Can a three-wheeler even be classified as a car? Dubbed as one of the worst cars ever made, the first model was launched in 1973, featuring a 750cc four-cylinder engine. Due to the Robin's lightweight fibreglass construction, it could achieve a nosebleed-inducing 85mph and economy of 70mpg. Every day Portsmouth players choose the worst performance in training and give the weakest link the mortifying honour of taking the banger home! 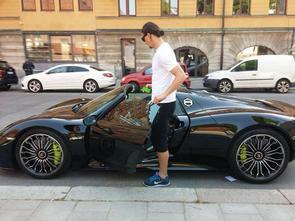 Swedish soccer player Zlatan Ibrahimovic is one of one of the finest players in the world, his blend of strength, performance and skill is unrivalled so it is only natural he would look for similar qualities in his car. The Porsche 918 Spyder is part of an exclusive fleet of hybrid hypercars that have been created with cutting edge technology. The 4.6-liter V8 kicks into action and can send the model off at almost 900 hp. With its super-fast changing gearbox and racing-esque engine, the 918 feels like a real racing car.